The first posting of the Dark Night of the Soul gave clue to the greater meaning and importance of this passage towards spiritual development; albeit an uncomfortable one. The Pathworking below can be used as a preparation and brief opening to the depths of this experience. In this way, we can relate the Dark Night as one of integration of those parts of ourselves which lay hidden in the shadows. We turn away from them, but they are ever present and waiting to inform us as we move forward on the Path. The crisis of faith that is so often considered one of the core elements of the Dark Night is the testing of our ability to integrate those places where there is no perfect love and perfect trust with that part of ourselves that intuitively knows that Divinity is within and therefore ever present. Turn your focus and attention to your breath. Allow your consciousness to move with the rise and fall of your chest and the filling and release of the lungs. Continue in this manner for several breaths; allowing each to become softer, smoother and slower. With each breath your physical body appears to lighten and your center of consciousness floats upwards towards the inner eye. You find yourself enveloped by the mist of transition between the Physical and Astral. And as this veil thins and you see before you an opening in the fabric of the space around you. A mist of Lavender surrounds this enclosure as you pass through the darkness of the Abyss. As you move through this space, feelings of foreboding and a sense of being out of place in a time that is neither here nor there and in a place that is both upwards and down simultaneously flood your emotions. You are disoriented and are aware of the depths of sadness and loneliness that is felt in this space. Your only thoughts are the hopes that you will pass quickly and easily through this space. Quite the contrary, time seems to slow and the angst seems to become greater. And, just as you are about to scream out in sheer frustration, you remember the lesson of surrender. You remember the call to trusting and the lessons of the “Fool”. You find that you are engulfed in shadow. Glimpses of light are hidden beneath what appear to be shadowy figures and although you do not feel threatened, you know this is a place of great power and well deserving of care and respect as you pass through. There is no flooring under you and you have a sense of weightlessness and somehow being suspended in space. Although there are no definitive boundaries, the impression is one of being enclosed tightly in a very confining space. You take a deep, cleansing breath and you allow yourself to simply be open, receptive and non-resistant to lesson of this place of shadow. You take another deep breath in and ready yourself to move forward and explore this place. As soon as the sigh of exhale has passed, feelings of sadness begin to well up within you. You are fearful and now wish you had decided against entering this space. Your former resolve of being receptive and open weakening steadily as you begin to feel that you are sinking even deeper into this space of darkness. You gently open your eyes and see that the blue veil of transition is just a few steps in front of you. You feel yourself enveloped in the veil of transition between the Physical and Astral world. The veils of transformation and all they contain gently fade from your sight and you begin the descent back into your physical state of being and the room and space in which you began this pathworking. Return to awareness of the rhythm of your breath and the rise and fall of your chest. Become aware of the physicality of where you are sitting or laying; your body pressed against cushion, chair or floor. Driving home from work and listening to Loreena McKennitt’s recording of “All Soul’s Night”. A deep longing for a return to a simpler place and time comes over me. The same feeling I remember early on when I had just begun the path of a witch. I remember hearing this song, and having a visceral and very palpable reaction to the music, the voice and the weaving of the lyrics. The simplicity of dancing around a fire, drums urging you on and the coolness of the night seemed as real as the van I was driving at the time. I remember the newness of finding a spiritual path so beautiful in its nature and expanse of devotion. And, the simplicity of honoring the Gods and Goddesses in heartfelt song, movement and small tokens of devotional offering. Flash forward to the present. I think on the many years that I have studied, trained and moved forward on this same path. Tears well up in eyes that for too long have sought out the complexity of the path and extended far beyond the simple act of acceptance of its beauty at face value. So, for tonight’s class, no fancy altar to make the lesson better understood. A single white candle lit in honor of our being fully and simply present to do the work of reaching out to the Divine. The concept of the Dark Night of the Soul is one that is experienced at specific times during the work of those on a spiritual Path. It is described as a state of utter loneliness, despair and the sense that the Divine has forsaken you. It is a moment that stands the test of true “faith” for in that hour of disconnect the realization of separateness and the intense yearning for union with the Divine are brought to the forefront of the experience. This descent into a type of abyss is what serves to strengthen the resolve and conviction of the human and releases the vestiges of ego and personality that do not serve well the spiritual nature. A Lesser form of this test of faith and spiritual strength can occur when we initiate the work of the coalescing the energies of mind and heart as a way to shatter the faulty foundations of our “ivory towers” or preconceived notions of what spiritual and magickal practice are and our individual power in those settings. The intensity of energetic response that occurs when pure mind and informed heart struggle to collaborate and become co-creators in creating a more enlightened state of being tests the seekers entire system of beliefs and understandings. Overwhelming darkness, depression, doubt and inertia are the natural byproducts until surrender to the process reveals the greater light of our true magickal nature in its most illumined and enlightened form. To continue this stream of thought and in keeping with the refinement of energies and forces as we move forward on our path, we see these dynamics held within the “hidden path” of our own shadow/dark nature. 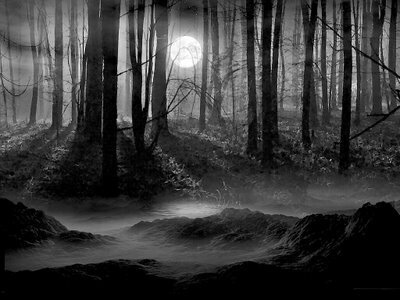 It is on this path that a Dark Night of the Soul is replicated at a Higher Level of refinement and offers up test once again of the faith and accumulated knowledge that has been worked upon as result of gathering together the courage to release and cut away what no longer serves in a manner that is both merciful and just in its selection. This is the call to the final surrender of personality and ego to enter the place of communion with the Higher Mind and the resultant creative outpour that is infused and informed by our Higher Selves in dialogue with Divinity. It is at this juncture that the shadow or darker nature of the self is met and aligned with its polarity of Light. This surrender to the dark nature held within is a means of opening to the greater Light. And, this great light is ultimately the way of illumination on ascent through a state of balance and integration of the parts of Self, which culminates in union with the brilliance of the Divine. The pain of this endurance is at once physical, spiritual and mental and it is at the point of the darkest hour when the darkness seems most pervasive that the ultimate reflection of our Higher Nature illuminated by the brilliance of Deity that points the way. At some point along a spiritual path we must also encounter what is often called the “shadow self”. This is an important milestone towards forward movement, and it is at that juncture that we have come upon the divergent path that offers choice of either embrace or retreat. So, what exactly is this shadow self? According to Carl Jung, there are within the human experience and consciousness several highly specialized archetypes that define the human psychological experience. These archetypes are closely linked to our physical nature and are often brought to the surface through the varied preconditioned responses that we have gathered from our environment of both instinctual and mental learning. These become the patterns that play out in our lives in a continuous thread until some upheaval of either a conscious or unconscious level brings out what has lain hidden within our psyche. This often plays out in the form of projection; or seeing the negative traits in others we encounter that are actually in resonance to those same qualities within ourselves, albeit latent and for the most part unacknowledged at a conscious level. Beginning shadow work can be a bit like going down the rabbit hole. It is not the most comfortable process and what may be lurking at the base of that unknown can be daunting. Ultimately, it can be one of the most rewarding types of work. Many times what you thought to be true for yourself will be challenged and tested as you reveal some of the underlying reasons for the way in which you move through life. We all wish to be seen in a positive light and the work of exploring our shadow self can provide clues and greater understanding of those qualities we wish to enhance and accentuate, those that we hold in reserve for the appropriate times and those that serve no useful purpose in this lifetime other than the fact that we are now more aware of those characteristics in a way that is informed. Additionally, this is a journey that only you can make with only your own resources, experiences and inner knowing as guides. To confront a person with his own shadow is to show him his own light… Carl G. Jung ..
As the quote above beautifully states, embracing those parts of yourself that are not usually brought into the light of day can, nonetheless, open the doorway to the greater light that ever burns within our being. If we think in terms of polarity and synthesis than we must acknowledge that the darkness only appears dark because we know of the polarity of light. Each gives validation, support and energy to the other in an, albeit transparent, way. Each, relying on the other’s existence to support and enhance the expression and work of its own existence. This becomes the point of synthesis and understanding that within this process of give and take, each must contain a portion of the other within itself as they move through their dance of cohesion and balance. If we hold these principles as viable occurrences within a natural order of being, then we could also say that in the darkest night the sun is still brilliantly shining whether we can see it from the perspective we are aligned with. But, with a shift of geographical coordinates, we move into its light and what was night becomes day. This concept is useful when approaching our darker nature. Despite what we may find lurking in the darkened corners of our personality, there is still shining that inner light that connects us with our higher state of being. When we learn to accept, acknowledge and embrace those parts of ourselves that we consider unlovable or undesirable we open to having conversation with those aspects and strengthen the potential to modify, change or completely transform that energy. The nature of the work and the feelings and sensations that are often brought to the surface are not easily dealt with on your own; regardless of your own personal level of experience. To set foot within the scope of these energies is arduous and often painful and could do damage to the psyche if not approached slowly, carefully and with the utmost of respect. It is best to do a little research first rather than diving right into this type of work as it can dredge up past memories and experiences that may cause unproductive discomfort. Be gentle with yourself and approach this work slowly and with reverence, affirming the best results for your highest good. And, as with each spiritual endeavor, always be mindful that the greatest journey we take is that which is the path leading back to ourselves as beings of Dark and Light that will return us to our Divine nature. In the last post, I shared a brief overview of the chakras and their unique energies. A good beginning practice to experientially acquaint yourself with the energy of the chakras and to move a clean flow of energy through each is to do a daily chakra renewal exercise. I suggest daily, because it should be a natural as brushing your teeth and as effective in keeping everything at peak condition. I have included a basic renewal meditation that can be used quite effectively below. Some like to begin their day with this exercise and others prefer to do so at night. Either is fine, the importance is to be consistent with execution. The entire process takes approximately 10 minutes and as you become more proficient, you will begin to sense when there is need to spend a bit more time on an individual chakra or when everything flows through smoothly and cleanly. You may do this sitting or lying down, keeping the spine straight and aligned with the head resting gently on the shoulders. Turn your focus and attention to your breath. Allow your consciousness to move with the rise and fall of your chest and the filling and release of the lungs. Continue in this manner for several breaths, allowing each to become softer, smoother and slower. Now, shift your awareness to visualize seven clear glass spheres within your energetic self, each aligned with a specific chakra point along the central column. And approx. 7-8 inches above your head is an eighth glass sphere. This is the transpersonal chakra; the gateway between your parts of Self and the Divine. Beginning at the root chakra, visualize the sphere filling with ruby red energy and light. As it continues to fill it becomes larger and more brilliant in color and form. When it has reached full capacity, turn your awareness to the sphere just above it. Visualize this sphere filling with vivid orange energy and light. As it continues to fill the sphere becomes larger and more brilliant in color and form. When it has reached full capacity, turn your awareness to the sphere just above it. Visualize this sphere filling with sunshine yellow energy and light. As it continues to fill the sphere becomes larger and more brilliant in color and form. When it has reached full capacity, turn your awareness to the sphere just above it. Visualize this sphere filling with emerald green energy and light. As it continues to fill the sphere becomes larger and more brilliant in color and form. When it has reached full capacity, turn your awareness to the sphere just above it. Visualize this sphere filling with sky blue energy and light. As it continues to fill the sphere becomes larger and more brilliant in color and form. When it has reached full capacity, turn your awareness to the sphere just above it. Visualize this sphere filling with indigo blue energy and light. As it continues to fill the sphere becomes larger and more brilliant in color and form. When it has reached full capacity, turn your awareness to the sphere just above it. Visualize this sphere filling with amethyst purple energy and light. As it continues to fill the sphere becomes larger and more brilliant in color and form. When it has reached full capacity, turn your awareness to the sphere just above it. You have reached the uppermost sphere, that of your transpersonal space. See this sphere fill with brilliant white light. It pulses radiant light and seems brighter than those below it in clarity and intensity. When it has reached capacity, see all the spheres equal in size, perfectly transparent and filled to capacity with colors that are clear and vibrant. Allow this image to permeate your being for several minutes. Feel the strength and power in each of the spheres and connect with this enlivening energy, engaging all of your sensations. Visualize a line of energy moving upwards from the ruby red sphere of the root chakra. This energetic pathway is the same hue of red as that contained within the sphere itself. It moves, and swirls and as it reaches upwards it blends and mingles with the orange energy within the sphere of the belly chakra. Allow the integration and synthesis of this energy to build and circulate. Now, extend this energy and visualize it moving upwards towards the yellow of the sacral chakra. Allow it to blend and merge creating an energetic column connecting each of the three spheres in turn. Each, feeding one into the other, merging and unifying into a singular stream of vibrant and pulsing energy. Continue in this manner moving up through each of the chakra points rising all the way up and ending at the transpersonal chakra. When reaching the transpersonal chakra, allow the brilliant white energy of the transpersonal sphere to pulse, infused with crystalline luminosity. As this energy builds it becomes brighter, fuller and more expansive. Allow this energy to grow and expand until it is overflowing and spilling down, pouring its energy into each of the spheres below it. Each, in turn filling with the brilliance of Light, the vibrancy of their individual colors fading and folding into the density of a brilliance of white. This transformation continues downward through each chakra and when it returns to the root chakra allow this energy to circulate, moving up and cascading down through each of the chakras for as long as is needed. When you feel energized and have a sense of balance, beginning at the transpersonal chakra, see this energy slowly dissipate as each globe clears and returns to a state of transparent glass. Move downward from one sphere to the next. Each in turn fading in brilliance, returning to its resting state of transparency and size. When you have returned to the root chakra and the spheres are once again clear pure transparent glass, chant a sustained “ OM “ to complete the working and coalesce the rate of vibration within each of the chakra columns in each of the subtle bodies. Final Thoughts: As you begin to work more with the varying energies of each of the chakras and synthesize and use their collective energies, you will begin to sense changes in yourself at all levels- spiritually and mundanely. Be open and receptive to what presents for you. Some will experience these changes as being able to concentrate more deeply on tasks at hand. Others may feel that they are developing a more compassionate attitude and have “softened” a bit in their judgment of others. Others still, may experienced heightened senses and feel more connected to the fluctuations and energetic stimuli that surrounds them. Surrender to the course of flow and allow yourself to be carried forward with the support of your own inner awakening. The focus of these articles is not the Paths of the Tree, but some explanation of their energetic state and connective function from sphere to sphere is necessary. The 22 Paths that connect the Sephiroth act as conduits/ filters and refiners of the energies of the connecting spheres. The Spheres are the pure states of Being, and the Paths allow for the movement of energy between the pillars of Force and Form. On the evolved or “Middle” Path, they become the direct line that mirrors the adage “as above (Kether or the Divine) , so below” (Malkuth or Manifestation) . Practical application of the Chakras, until recent years was generally only used by those following an Eastern path of spiritual development. The information about Chakras and their correspondences and individual names are derived from the Vedas and presented as aspects of Brahma. Although theses have always been engaged and used in magickal workings, the entire networking, naming and mapping of the energetic body, had a different emphasis and point of origin that was not necessarily aligned with the semantics of identifying the components as chakras and subtle bodies. Today, we as conscious magick workers incorporate and infuse our work and methodology with a variety of sources and ancient systems of knowledge. The overlap of Eastern and Western Hermetics is becoming the standard for many magickal groups and traditions, and the efficacy of this collaborative perspective including use of the chakras and their corresponding energetic anatomy is part of the foundational work of a well-rounded magician. The name Chakra comes from the Sanskrit word meaning” wheel or disk”. 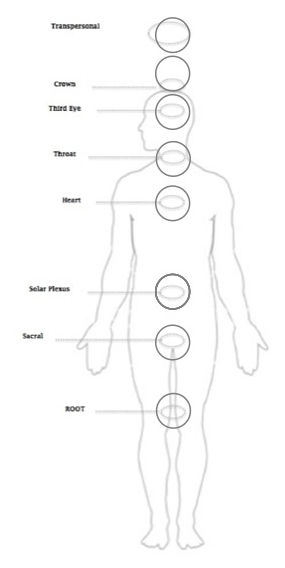 These centers or wheels of energy are considered the vortex points along the central axis of the body that continually open and close in response to our emotions and stimuli from the outer world. The Chakras operate like valves that channel the electrical current of the Universal Life Force, or ***Kundalini/ into the body. Each chakra is represented as a multi-petaled lotus, the number of petals varying according to the particular chakra. This imagery has been been the norm in representing the chakras and was largely derived from the consistent reports and experiences of those gifted with the sight to see the energy signatures and patterns. Of course, as is true of any viable system the visual perception of what these energy centers looks like has to some degree evolved into new interpretation filtered through the philosophies and knowledge base of the individual. There are hundreds of decks of Tarot cards now, but the images depicted on the Rider-Waite deck are still those used as the beginning staple of tarot study. Wuth that in mind, I would refer you to the traditional Indian images, colors and association with the lotus. Our bodies are comprised of energy. Most of that energy is unseen. The hard wiring of our system is an elaborate network of meridians *, nadis ** and chakras all contained within each of the subtle bodies simultaneously. This concept is similar to that of the hall of reflective mirrors: each reflecting the image of the other, contained within the other ad infinitum. The chakras work in tandem with and within these networks. And, the vibratory rate and flow of their energy adjusts in resonance to the more refined nature of each of the subtle bodies in which they reside. 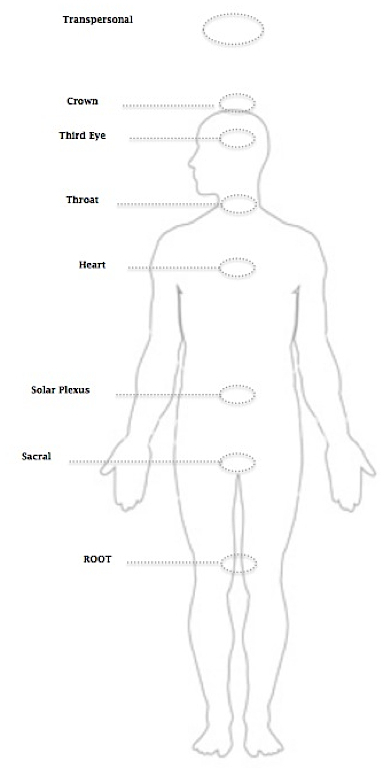 * The meridians are the pathways of chi (energy) and blood flow through the body. ** The nadis are the channels through which the enlivened kundalini energy passes in its upwards movement. The Chakras reside etherically within the subtle bodies and could be considered the vital organs of each of the layers of subtle bodies that incorporate our being. The traditional Hindu system names seven major chakras.But, there are in fact hundreds of chakras throughout our body. Two that commonly open when doing work with hands are located within the palms of each. And, two others are located centrally within the soles of the feet and are what we connect with and open when we do a grounding meditation to connect with the earth’s energy. See the image to the right. Each Chakra has multiple correspondences assigned to it. The color designates the vibrational scale of that particular chakra and the element the essence of its primary energy. Each chakra has a specific function /or energetic nature as it relates to the location of the chakra. The affirmation of the chakra declares its intent. When studying these correlates they serve to bring the individual closer to understanding the entire system that comprises the energetic make-up of our physical and subtle bodies. In consciously focusing the intent and energy of individual or combinations of specific chakras we can affect change in how we present our selves magickally and mundanely. If one is teaching, the focus could be on enlivening the throat, third eye and crown chakras so that the presentation of material will be inspired (Crown), intuitive (Third Eye) and carried with the bolster of right communication (Throat). If an important interview or meeting with someone you normally feel intimidated by and find difficulty in finding your own will is scheduled; empower the collaborative efforts of the Throat (communication) and the Solar Plexus (the seat of your personal power and will) to strengthen your interaction and bolster your point of view. And, if there is need for a compassionate quality, engage the heart and throat chakras so you will project from a heart-centered space. When energy is running smoothly through each of these chakras there is a balance that is achieved allowing the individual to function at their highest capacity on all levels; mundanely and spiritually. If there is an imbalance or lessening of flow through a specific or multiple chakras, the individual may feel lethargic, sluggish and be less effectual in magickal and mundane endeavors. A good beginning practice to acquaint yourself with the energy of the chakras and to move a clean flow of energy through each is to do a daily chakra renewal exercise. I suggest daily, because it should be a natural as brushing your teeth and as effective in keeping everything at peak condition. Next week I will post a basic renewal exercise that can be incorporated into your daily practice. In the meanwhile, try to note where you feel energy flowing the most easily from and through your body as you move through the week. If possible, also note how and where this changes in a variety of situations and range of emotions. The more often you give pause and note these sensations, the more connected you will become to your specific energetic patterns and better able to focus in on how your chakra system responds to its environment.